In keeping with Age and Source Verification for our next crop of calves, this calf was born August 29, 2018 and posed for Robbin and I on our way up to look at the cows in Greasy where we found two more new babies. With a couple of weather changes in the past ten days, it feels like fall now, but we know we’re liable for more 100-degree days this month and next. Still somewhat understocked from the drought as we rebuild our cow herd from our own replacement heifers, we found plenty of feed and water and most of the cows heavy with calf. With bull sales all over California this month, we’re excited to add some new Angus genetics to our herd, hoping that sagging salvage values will keep bull prices reasonable. 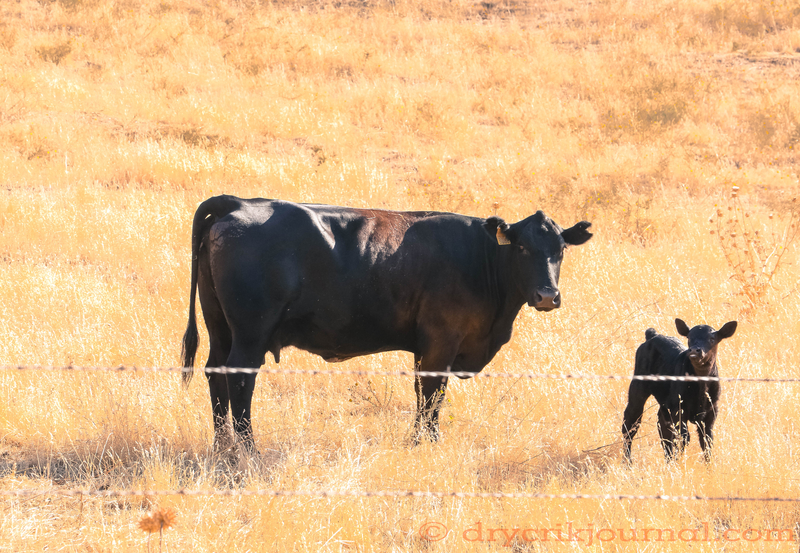 This entry was posted in Photographs, Ranch Journal and tagged Calves, first calf, photography. Bookmark the permalink. So the cows have their calves all by themselves, without any human assistance? That’s right. Occasionally a first-calf heifer may need help, but for the most part, they get along better without human interference.